An introductory comment: A reader responding to a recent post asked if I (and other writers in this series) saw any future in evangelicalism at all because he read the posts as attacking evangelical positions. I’ve been pondering that over the past few weeks and realize that I could be clearer on my intent. I’m raising concerns about some aspects of evangelical culture in an attempt to call out the latent consequences those pieces may have — especially in terms of the broader culture hearing the heart of evangelicalism as it shares the love of Christ in prophetic ways to the broader society. After the critique, I’ll try to do a better job of speaking to the positive future. It was the fall of 1981 and I was teaching my very first Introduction to Sociology class. I’d been a TA for the course in grad school but now I was responsible for the lectures myself. When I got to the broad institutional areas (of which Politics is one), I contrasted different views of governance: town hall democracy, Jeffersonian government by elites, oligarchy, and special interests. As I finished giving the lecture, I suggested that many in the church had adopted special interest tactics and that I was worried that the Body of Christ would be seen as simply another advocacy group. The Moral Majority had been formally established just two years prior and CNN the year after that. Evangelical leaders like Jerry Falwell could regularly be found on the new cable news outlet speaking on political issues on behalf of Christians. It had been eight years since the Roe v. Wade decision but was still five years away from the formation of Operation Rescue. Sociology professors talking to undergraduates are not prophets. Yet in my own small way, I was trying to be a voice about something that could prove problematic. Maybe if my undergrads paid attention and acted differently as a result, we’d find a better way of engaging the political realm. The last three decades have seen my meager warnings come to full flower. We now have major political organizations organized around Christian themes (e.g., Family Research Council). Or are they Christian organizations organized around political themes (e.g., The Family Leader)? When political candidates flock to the Value Voters Summit (“Faith, Family, and Opportunity for All”) to prove their conservative credential to a room full of Christian delegates, the lines between religion and politics seem to disappear. The impact of “evangelical as special interest group” has been well documented. Thomas Frank’s What’s the Matter with Kansas? suggested about a decade ago that evangelical voters were enticed into voting for political candidates on promises to address social issues like abortion and prayer in schools but those issues didn’t remain important to the candidates after the election. He argues quite cynically (Frank is really good at cynicism) that if the issues were addressed, the voters might return to their economic interests as a basis for voting. Perversely, one of the outcomes of the special interest approach is that the establishment keeps the issue on the table to maintain funding and voter participation but doesn’t create the desired social change. The dynamics of the special interest approach show up in the midst of the “millennials leaving church” argument. The Barna Group’s data suggests that at least some of the disaffection of today’s young people comes from seeing church leaders as overly strident on social issues, being anti-science, anti-homosexual. In short, it’s about being known for what one is against and not what one is for. Listen to any news program discuss what “evangelical voters” care about. Sure, they’ll take about their concerns over abortion or traditional definitions of marriage. But you’re just as likely to hear them decry Obamacare, support lower taxes and limited government, and favor a strong military. This is another outgrowth of the special interest approach — parties build “big tents” of various special interests and those coalitions start to bleed over into common talking points. Evangelicals may have access to varied outlets in television, radio, or internet, but it doesn’t change the basic principle of electoral politics: numbers. Consider the following chart produced by UConn sociologist Bradley Wright from General Social Survey data. It’s his estimate of the percentage of Americans who can be classified as evangelicals. 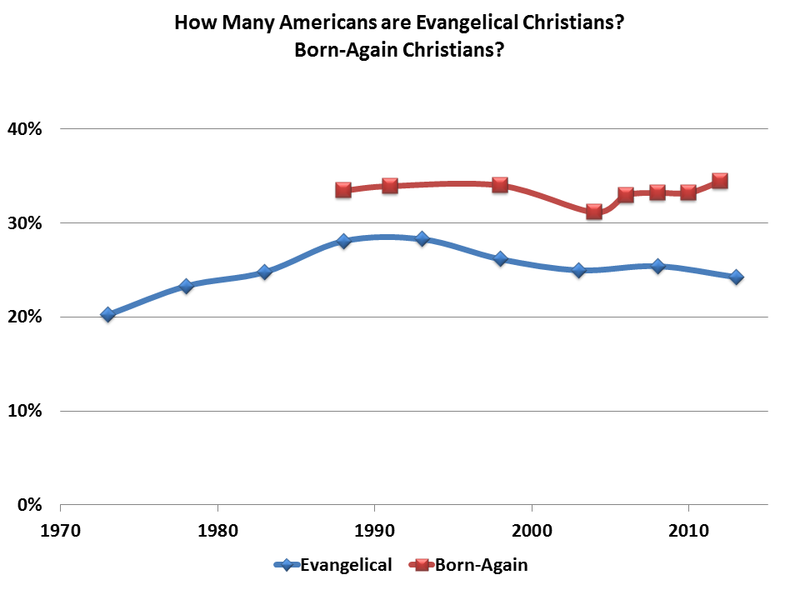 The GSS data suggests that evangelical strength peaked in about 1990 and has been slowly waning since. Other data suggests it’s waning even more rapidly among the young with the percentage evangelical for those under 30 falling to 17% in 2010. This means that evangelicals cannot shape public policy without significant assistance from non-evangelicals. That 24% of the public may be strident and therefore more likely to vote than the average citizen, but elections are likely to follow demographic trends similar to the 2012 election. Here ends the negative griping. What is the alternative going forward? Let me suggest three strategies. Second, regardless of one’s view of Christian America rhetoric (there are a vast number of good Christian history sources laying the claim to rest, but it survives in spite of it), we need to craft an understanding of the country based on the current realities. Let’s not fight over Jefferson’s views on religion or the church memberships of the signers of the Declaration. We live in a culture that is marked by demographic diversity. We are surrounded by ideological diversity. We need to engage that discussion on the basis of guiding values and not on claims of superiority. It will require much patience, careful listening, and far less pronouncing. While 24% of the public isn’t majority language, it’s worth being heard as evangelicals. Third, evangelicals are at our best when we’re advocating for those who can’t advocate for themselves. This has been the heart of the pro-life movement. But it goes beyond that. It means that we are passionate about justice — not just in a narrow partisan sense but in the “least of these” sense. Let’s worry less about political party orientation and think together with non-evangelicals about how we speak on behalf of those without voice. The poor, the broken, the abandoned, the hurting, the addicted, the dispirited. As people reflecting God who gave himself up for us, we cannot be guilty of a self-interested approach to democracy. It’s not about us. We already received more than we could possible imaging. It’s about “liberty and justice for all”. There’s a reason the pledge ends with that line. It’s the hope of the nation and evangelicals have a unique role in seeing that hope come to fruition.